Urbanization and industrialization has lead to scarcity of land with good bearing capacities thus forcing the construction over sites deemed unsuitable for such activities. To improve the geotechnical properties of soil of such sites soil stabilization methods are adopted. Use of graded aggregates as additives to such soil followed by compaction is an old technique of mechanical soil stabilization increases the support quality of soil and also provides material economy. Sand is used for the purpose but is getting scares day by day due to its large field of application. Rock quarry dust is a solid waste product produced in large scale during crushing operations of stones and rocks to obtain aggregates. Similarity in mineral composition and inertness in structure has made it possible to use them as the graded aggregate material and suitable alternative to sand for geotechnical operations. Also bulk utilization of this waste has become necessary due to geo environmental problems related to its disposal. 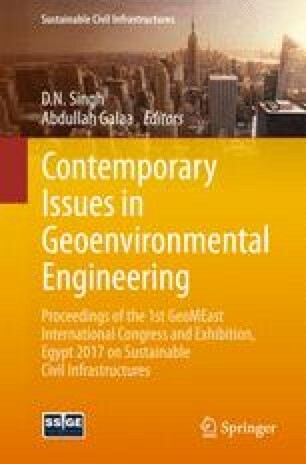 The objective of this paper is to investigate the effect of quarry dust addition of different gradations on the compaction behavior of clay of different compressibility. A series of light compaction tests were carried out on soil mixes prepared with different quarry dust content with a locally available clayey soil and commercially available bentonite clay. Variation in the maximum dry density (MDD) and optimum moisture content (OMC) values has been obtained with increasing content and use of different gradations of quarry dust in the two clay types. Also the compaction characteristics are compared to those of clay-sand mixes by using sand samples having similar gradation to that of quarry dust. An effort has also been made to compare the MDD-OMC relationship of soil mixes of present study to that of naturally occurring soil found in literature.